Helen Mary Schifano was born April 13, 1922 in Newark and grew up in East Orange. At the age of 9, her parents enrolled her in a gymnastics class at the Newark Turners under the mistaken impression that it was acrobatic dancing. She stuck with it for six months before quitting. Helen’s mother convinced her to return and she soon became the gym’s top performer. Often, her coaches would hold her out of event so as not to humiliate her young opponents. 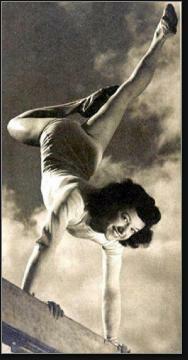 Helen won national acclaim in 1939, when she finished fourth in the AAU all-around competition. A top student at East Orange High, she set a school record by typing 79 words a minute. Those typing skills would come in handy later in life. The 1940 and 1944 Olympics were not held because of World War II, delaying Helen’s international career, but she won her first AAU gold medal in 1941 in the parallel bars. The Newark Turners building was destroyed by a fire, so she moved to the Elizabeth Turners and began training with coach William Schwarz. She supported herself working in the Newark Post Office. Helen began winning national titles again in 1946 and 1947, including the 1947 all-around championship in Dallas. 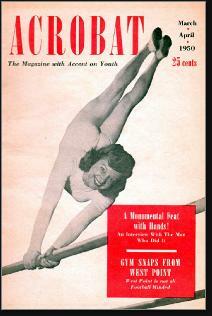 In 1948, she was the U.S. all-around champion and also won a gold medal in the vault in Philadelphia. At the 1948 Olympics, Helen led the American team to its first-ever team medal (bronze). She received the top all-around score on the team; her best individual finish was second, in the vault, but individual gymnastics medals were not awarded to women until 1952. In 1952, Helen married Clifford Sjursen. She had met him in 1948 at the Elizabeth Turners. Clifford had been a competitive gymnast since 1938, and was a pilot during the war. Clifford worked for Bell Labs and Helen worked for an insurance company. They raised four children in Fanwood. During the 1950s, 60s and 70s, Helen authored 10 gymnastics books and was a regular contributor to Gymnast and Modern Gymnastics magazines. She also competed in senior division events. Helen founded the New Jersey Gymnastics Association and was a member of the U.S. Olympic Gymnastics Committee. She also served as a judge in national meets and coached the U.S. team in several international tournaments. 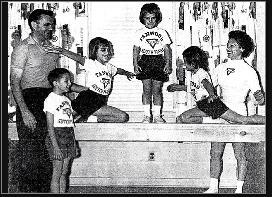 Helen and Clifford coached gymnastics at the Fanwood-Scotch Plains YMCA until 1980 and she was a Phys. Ed. teacher at the St. Bartholomew School and the Wardlaw-Hartridge School in Union County. She passed away at the age of 85.